Why did you choose this person? You know, I could get into a lot of rhetoric here because I honestly agree with many of Romney’s talking points. But I am assuming you are tired of hearing those over and over so I’ll boil it down to one issue for now and make it personal. It’s all about the economy and here’s why. After my divorce, I went on a credit spiral. I’ve talked about it on this blog before, but the short version is, I made some choices (some bad, some necessary) and got into debt. Once I was there though, I was drowning. I needed to borrow just to make ends meet and was constantly using up all my money to pay someone back. My credit score was terrible and I needed to get a grip. Little did I know my then boyfriend (now husband) was pretty great at saving and being frugal. Some might call him cheap, but he really isn’t. He had a totally different mindset when it came to money. He wasn’t denying himself, he just valued things and money differently. As months passed, he showed me how to cut spending in areas and pay off my debt. I cancelled my cable subscription. I went out to eat less. I got a better job. Eventually, I paid my debts and bought my first home in my own name just a couple years after I was nearly evicted from my apartment for overdue rent (and yes they actually locked me out). I believe this is where America is and we need to take the situation seriously. We can no longer roll our eyes at the debt and say, but we NEED these things! And we have to stop pointing fingers and saying he started it!! We don’t need to borrow more money to plug the hole. We need someone to stop the bleeding. We need someone to fix it and I think Mitt Romney’s plan will do just that. People have been jumping all over Romney’s Big Bird comment in the first debate because Big Bird is such a beloved icon. But we don’t eat Big Bird for breakfast people. Big Bird doesn’t keep the heat on and gas up our cars. And I get it, there are many more programs that make a much larger impact than Sesame Street. But the deeper point here is the mindset. I have learned that you don’t actually have to live with debt. You don’t actually have to spend your whole life working and worrying to pay down a never ending loan. My number one reason to vote for Mitt Romney is due to his business experience and plan to reduce the national debt. It’s not out of fear. It’s to promote freedom. I truly believe that. Are you a parent? I have 2 boys, Oscar and Calvin. Why do you think your candidate is the best choice for parents? My sons are just 3 and 1 so they have a lot of growing up to do. Like most parents, I want them to have access to opportunity and the so-called American Dream. But I want them to understand that they have to earn it. Despite all of our problems, America is a nation of affluence. We have drinking water at our disposal. We have indoor plumbing. Many of our basic needs are met so we have the luxury of spending our days thinking about our dreams. I want my boys to grow up in a country that rewards hard work. I believe in equal opportunity, but I understand that some people will do more with that opportunity than others. That is humanity and I don’t think there is a program to cure that. What I fear are programs that are so over-focused on equality that no one pushes the limit and the ceiling gets lower and lower. This is not to say that we shouldn’t help those who have genuine need. Simply put, I think there is a balance and we have lost that balance. There is room for compassion and responsibility in America and I want my boys to learn how to walk that line. Mitt Romney has walked that line in his personal life by his generous donations of time and money to individuals and charity. Do you feel like your candidate is misunderstood? Why? I think the debates really changed everything by giving Mitt Romney a chance to speak for himself after a summer full of negative campaign ads. Like him or not, I think he represented himself and his platform well and really laid out his ideas for America. It’s cool if you disagree with him, but I hope you took the time to really listen and consider him as a viable candidate. I want to take a minute to say to the Obama supporters that I do not hate President Obama. I disagree with his policies and I will show it with my vote. But come what may on Tuesday, we are still a country whether or not our side ‘wins’. What I want more than anything is for the two parties to man up (or woman up) and work together. 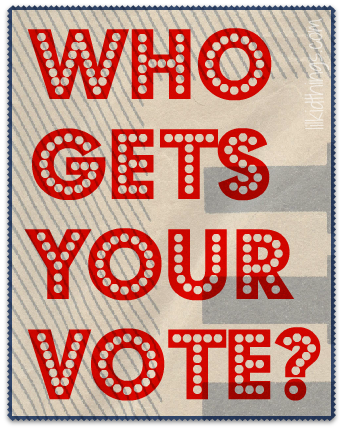 Thanks for reading Who Gets your Vote?! Each Tuesday I highlighted at least one reader opinion about the upcoming Presidential election. The point of this series is to get real people to answer real questions about this election. We aren’t all the same and we don’t vote the same. I happen to think that is ok and welcome opinions that are different than my own. I’d love to see some healthy discussion in the comments! Tomorrow is the day! Now go VOTE!! Are you still undecided? Below are a list of websites to check out while trying to decide on the best candidate for you. We voted. And now we wait. Well written, Andrea! I fully expect to see pictures of you and an “I Voted” sticker tomorrow! Oh you will see it! Great series you’ve been running and so great that you chose to showcase voters from all different persuasions! great post. I love how much thought you put into sharing the whys.